The 2019 race date is on August 3, 2019 at 5:00:00 AM/PST. The 2019 training weekend is on May 10-12, 2019 and click here for more info. 1) All Lottery entrants will need to have run an Official (i.e. timed race with published results) 50+ Mile Race in 2018 (1/1/18-12/1/18) in order to register for the Lottery. 2) There will be 220 spots for the Lottery. The roughly 30 remaining spots are reserved for volunteers, sponsors, and Sterling Silver Ticket Winners. 3) Runners that have consistently entered each year and not been drawn in the AC100 Lotteries will be given an extra ticket for each year they have not been selected. 4) Runners will get 1 more ticket for each year they have finished AC100. 5) Solo Runners will get 1 more ticket, and are eligible for special Solo Division Awards, Buckles, and T-shirt. 6) A Wait List of 100 runners will also be pulled automatically. We will add Wait List runners to the race until July 1st. 7) If you are on the Wait List, you will automatically be charged the Entry Fee whenever a runner drops from the Start List. If you do not want to be charged, please drop from the Wait List on your UltraSignUp.com profile under "Registration History - Edit". 8) All runners in the race will complete Trail Work by July 22nd. 9) Refunds for all runners: 50% up until March 1st, 25% up until June 1st. Starting with the 2019 Lottery, held in December 3rd, we will be now offering a Waiting List. You can read all the details in the FAQ within the "Lottery / Waiting List / Refund Policy" section. 2019 Lottery registration will be on UltraSignUp.com and will begin on Monday 12:00 Noon on December 3, 2018 and will remain open for one week, closing on Monday 12:00 Noon PST December 10th. 1) Runners must complete an Official 50 Mile Race prior to entering the Lottery. 2) The Solo Runner will have priority in the Lottery. However, we have to balance the field with both Solo Runner and Runners with crew. If a top two Finisher in the races are already entered in AC100 or declines an entry, the spots will roll down no further than 5th place. The Sterling Silver Ticket Winners must sign up and pay the Entry Fee within one week, and will need to submit Trail Work proof prior to race day. 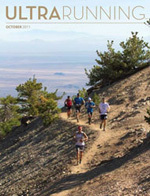 The purpose of the Solo Runner Program is to give runners a primitive experience of running 100 miles and remove cars from the course. The Solo Runner is a runner that runs the race without a crew or a pacer and does not have any support vehicles on the course, including Spectators that cheer them on but do not provide aid to runners, except one car at the Start (Wrightwood) or at the Finish (Loma Alta Park). 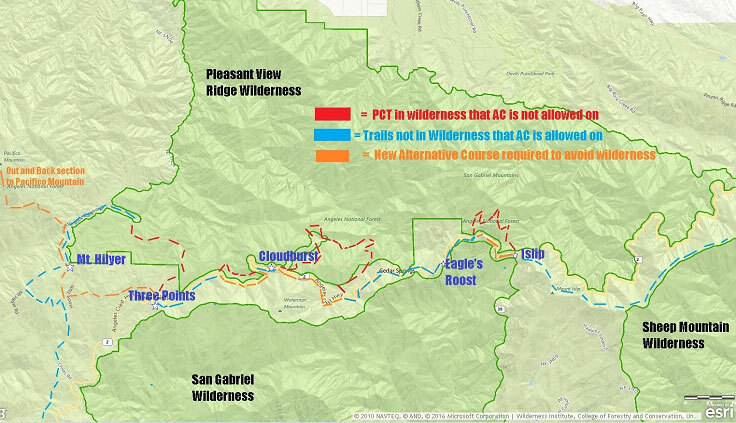 Pacer will be only allowed at Chilao and Chantry Flats. New Pacers will not be allowed at Shortcut Saddle or Red Box. Only one "crew vehicle" with Car Pass will be allowed access to Chilao and Chantry Flats aid station. A Car Pass will be given the runner when the runner registers in Wrightwood on Friday morning. Pacers cannot leave their vehicles at: Chilao, Chantry Flats or at any aid station on the course. Vehicle left by a Pacer at: Chilao, Chantry Flats and the access road to Chantry or at any aid station on the course, will automatically disqualify their runner. Recommendation: if you are going to use two Pacers, you can have one at Chilao and a second one at Chantry. Have the crew with the Car Pass drive the first Pacer to Chilao, then drive the second Pacer to Chanry and exchange Pacers, without leaving a vehicle at Chilao or Chantry. Any runner 65 years and older can have a Pacer for 100 miles. Parking on the course during the race. Only one crew vehicle with a Car Pass will be allowed to park at: 1) the aid station parking lot or 2) on the shoulder of Hwy 2 on the course near the aid station. If you park on the shoulder of Hwy 2, be sure you park "legally". Do not park over the 'white fog line' or you may get a ticket from the CHP and we will hold your runner for one hour for the first infraction and disqualify your runner on the second infraction. Finish an Official 50 Mile Run prior to entering the Lottery. Race disputes must be presented prior to the Award Ceremony. Once the Race Director presents the runner their Award, then the results are official. AC100 Awards are not for sale. If you lose an Award (buckle, plaque or bronze award) you cannot buy a replacement award from the race. The only way you can get an award is to finish the race and receive the award at the Award Ceremony. 2) Only one car per runner on the course, including Spectators that will be cheering for their runners but not providing aid. This includes parking cars at Wrightwood and Loma Alta Park. 4) Penalty: we will hold your runner for one hour for the first infraction and disqualify him on the second infraction. Remote wilderness (Newcomb, Idlehour, Sam Merrill and Millard) checkpoints leaders that lead checkpoints that are behind locked gates are required to insure the health and safety of the dropped runner and to take the dropped runner out of the area the following morning when the checkpoint closes while continuing to assist other runners that are in the race. Drop bag pickup in WW on Friday at 12:30PM 11:00AM begining August 2018. Click on the Personal Data button at the top of the website to change your personal data i.e. email address. Be sure your email address is up to date. We only communicate via email. Click on the Trail Maint. button on the top of the website to enter your Trail Maintenance Data. The 2017 AC100 Entry List provides the status of your Trail Maintenance Data. If it has been approve, their will be a "green check" there. Everything you need to run this race is on this website including race results, splits, photos and video taken during the race. 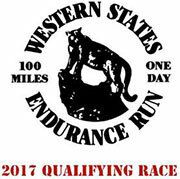 1) Qualify: All runners must complete at least an Offiicial 50 Mile Run prior to entering the Lottery. 2) Perform Trail Maintenance: All runners must complete 8 hours of trail maintenance by July 22nd. 2) "password" which will be emailed to you after you register on-line. So they can enter Trail Maintenance Data. If the data they entered is incorrect or needs updating, they can re-enter their AC100 Database and correct it. We only have one database and it is the Runners responsibility to keep their Data up to date. We are having problems managing the Drop Bags. 1) Use only black "chisel tip" Sharpie Permanent Marker felt tip pen. Your Bib Number is what we use to retrieve your Drop Bag at each Checkpoint, once you enter the Checkpoint. They are normally arranged in numerical order at each Checkpoint. When your Bib Number is not clear/visible (especially at the late evening Checkpoint) it will slow down the retrieval of your Drop Bag. The Bib Numbers/Runners Name is on the AC100 Roster on the website. Make your Drop Bags before you arrive in Wrightwood. PLAN AHEAD! The Drop Bags will be picked up at 12:30PM 11:00AM on Friday (begining August 2018). All Training Run / Trail Maintenance Work Schedule will be posted on this website, normally by the end of March. We also have to deal with the aftermath of this years Winter rain on our Trails and Access Roads to perform the Trail Maintenance Work. If you live in Southern California (South of Fresno), then you will be required to perform your Trail Work in the Angeles National Forest with Gary. However, if you live in Northern California or any other state or country, then perform your Trail Work in the area that you live and run. Trail Maintenance must be performed, submitted and approved before race weekend. Pack out what you packed into the Forest. It is very important for this future of this race, that all AC100 participant: runners, crews and volunteers to "pack out what you packed in" and not leave a trace, when you leave the forest, except your footprint. Do not place your trash in the "brown bear proof trash receptacles". During race weekend please do not place your trash in them. USFS does not have the budget to maintain them for the race. They are there for the general publics use only. Runners will get 2 bibs. The large bib goes for the "front of your jersey". The small bib for Solo Runners only will be placed "on the front of your hat" (mandatory for Solo Runners). "Runner 'your bib #' checking in" to a race official. "Runner 'your bib #' checking out" to a race official. wearing clothing that covers there bib "on front of your jersey". Downside is: your "splits" will be blank, where we do not get your check-in/check-out. If you are interested in being a Medical Volunteer, go to the website and click on the Medical Volunteer Button and fill out a brief form. Be sure to state your interest in joining the medical team and gives us your medical background. If you are involved in mountain trail endurance running, you know it takes a small army of volunteers to put on a "point to point" 100 mile endurance run. -Millard Checkpoint at 95 miles into the race. 2) help staffing our kitchen at the Finish Line at Loma Alta Park in Altadena. 3) medical volunteers as part of the new AC100 Medical Team, i.e. Paramedics, Nurse, EMTs, First Aid. Everyone that volunteers with the AC100 Medical Team will be covered by professional medical liability insurance. 5) help trail sweeping (preferably with HAM radio). 6) experienced trail maintenance people that can lead large AC100 Trail Maintenance teams on the weekend starting in early April through middle of July. Click on the VOLUNTEER BUTTON on the website and fill out the brief questionaire. With the predicted heavy rain in a series of winter storms, Angeles National Forest and San Gabriel Mountains National Monument officials have closed multiple recreation areas to ensure public safety. are both posted on the top of the website. For all future race dates click on the box: "click for entire message". Parking at Loma Alta Park during the race. The biggest challenge of putting on the race is controlling where we park vehicles during the race. Parking at Loma Alta Park was never intended to handle vehicle from 250+ runner/crew/pacer. In order to minimize the parking problem we need your help. As the race grows in popularity, vehicle parking problem will also grow unless we try to fix it before it becomes a major problem. Loma Alta Park: Do not park your vehicles in the parking lot off Palm Street just South of the restrooms. This parking lot is only for Run Management. We need parking spaces close to the park to put on the race. We are only allowed to reserve 15 parking spaces. The rest are not posted and available for general public use. However, we need all of the parking spaces, even if it is not posted. There plenty of parking on Lincoln Ave, Palm Street, Loma Alta Drive and Sunset Ridge Road. There are two large parking lots off Sunset Ridge Road next to the baseball field and the pool area. All future races will be the first weekend in August. The race is on Sa/Su. We provide the Th/Fr dates for Wrightwood planning purposes since the race weekend can straddle both July and August and cause confusion. Driving to Chantry Flats during race weekend. Chantry Flats is open to crews. However, parking is very limited! Do not take a motor home or any large vehicle because of the limited space to drive, park and turn around. There is also "one-way" section near the end of the drive, to accommodate a damaged section of the road that has not been repaired yet. The USFS has increased its focus on safety. Volunteers working in the forest are now required to wear long pants and shirts, gloves and work boots (not running/tennis shoes etc). Hard hats if available. These are now USFS requirements, not requests. Please comply. Meet at Loma Alta Park at 7 AM to shuttle runners to Chantry Flat. Meet at Shortcut Saddle at 7:30 AM to shuttle runners to Islip Saddle. Meet at Chantry Flat at 7:30 AM to shuttle runners to Shortcut Saddle. Wear long pants and a long-sleeve shirt (dress for temps 35° to 80°) …bring gloves. Food & water (enough for a full day’s hike/work) …and be mobile. 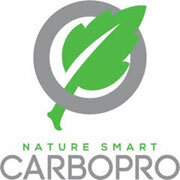 Bring Energy and positive attitude… “OUR FOREST” needs our help to care for it. What is the Pleasant View Ridge Wilderness, and why isn't the Angeles Crest 100 Mile Endurance Run (AC100) allowed to use it this year? The Pleasant View Ridge Wilderness was created in 2009 by the lobbying efforts of the Sierra Club. Federal guidelines prevent wilderness areas from being used for competitive events. AC100 had been maintaining and using the trails these long before the wilderness area was created and the USFS/ANF has allowed race organizers to use the wilderness area while they worked with local congressmen on getting a permanent exemption. Is there any precedent for granting a permanent exemption? 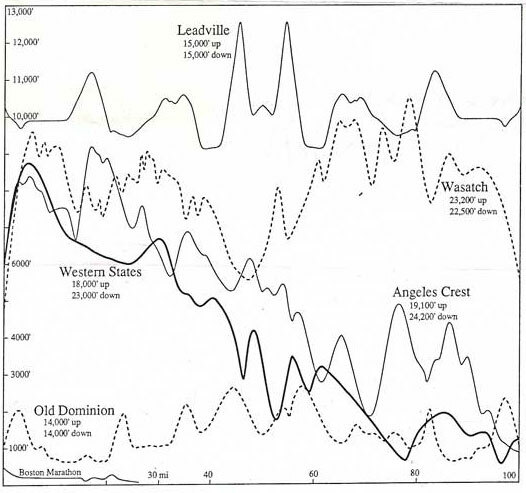 Yes, the Western States 100 Mile Endurance Run (WS100) experienced the same encroachment of wilderness with the creation of the Granite Chief Wilderness in 1984. 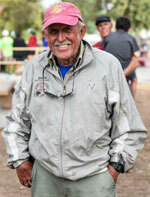 Wendell Robie, the founder of the Tevis Cup (the 100 mile endurance horse ride that preceded the WS100) called in a favor from his friend, President Ronald Reagan, who allowed both the Tevis Cup and WS100 to be "grandfathered in" and allowed both the ride and the run to continue to take place in the wilderness. Since then, Western States has always been granted access to put on there event in the wilderness area. And they paid back the Tahoe Forest Service with several thousand hours of conservation through trail work. It is AC100's goal to procure a similar favor from President Barack Obama who is a supporter of positive community events like AC100 which bring together volunteers and runners to build character and camaraderie through maintaining trails and running 100 miles. Sign the very brief petition and clicking the confirmation button on the e-mail that arrives in your inbox https://wh.gov/iH2KF. Additionally, we ask that you share this link with as many people as possible to help us reach our goal of 100,000 petitions by July 28, 2016; which will guarantee a response from the White House. Why should AC100 get a permanent exemption? AC100 has many passionate runners and volunteers that take conservation very seriously and always leave the trails better than they left them. Without AC100 maintaining these trails, many would become overgrown and impassable due to limited forest service budgets for trail maintenance. The AC100 trail work program requires all entrants south of Fresno to volunteer 8 hours of their time doing trail work on the course, which includes trimming brush, managing culverts, building retaining walls, clearing down trees, and improving tread. This ensures a passable corridor through remote areas that allow for all trail users to have access to beautiful wilderness areas. Without AC100 trail maintenance program, PCT thru hikers, day hikers, mountain bikers and trail runners would not have reliable access through Sulfur Springs, Mt. Williamson, Idlehour Canyon, Shortcut Canyon, Cooper Canyon, and Santa Anita Canyon. Also, we hope to continue the precedent that was set for Western States and to allow other historic race courses to do the same as more land is set aside each year for new wilderness areas. Though AC100's problem may seem isolated, there are other courses that use terrain that is being lobbied for wilderness status as well. The concept of wilderness is not a negative one, as long as it is managed with a positive interpretation of the Wilderness Act of 1974 that allows organizations like AC100 to maintain and respectfully use beautiful and pristine areas.